AS was explained in Chapter I (The Beginnings Of Photography), the sensitive coating on films and papers consists of bromide or chloride of silver held in a thin layer of gelatine, and thus, photography depends upon the fact that the shiny, white metal silver when combined with certain other substances forms compounds which are sensitive to light and which are changed in their nature when they are exposed to light. Chemical compounds are formed by the combination in definite proportions of a limited number of elements, of which about eighty exist. These elements may be divided into the two classes of metals and non-metals, and the metals combining with the non-metals form compounds called salts. These salts are not usually formed by the direct combination of the metal and the non-metal but by the agency of acids. Fig. 35. Crystals of Silver Nitrate. Thus, the first step in making a light sensitive compound of silver is to dissolve the silver in nitric acid. After the silver has been dissolved by the acid, and then dried up we get flat, plate-like crystals of silver nitrate. These crystals of silver nitrate dissolve in water quite easily, but if some cooking salt solution is added to the silver nitrate solution, the silver combines with one of the components of the salt, called chlorine, and the silver chloride that is produced is not soluble in water, so that it will be visible as a sort of white mud in the solution. Chlorine is one of a group of elements which, because they occur in sea salt, are called halogens, from the Greek name for the salt sea. Two others of these elements are bromine and iodine, and the silver compounds with these three elements are distinguished by their extreme insolubility in water and their sensitiveness to light. Silver bromide is more insoluble than silver chloride and is pale yellow in colour; silver iodide is still more insoluble and is strongly yellow. These silver compounds are formed by simply adding a solution of a chloride (such as cooking salt), bromide or iodide to a solution of silver nitrate. If this is done in a water solution, the silver compound will settle down to the bottom of the vessel, but this may be prevented by adding to the water some gelatine, like that used for cooking. 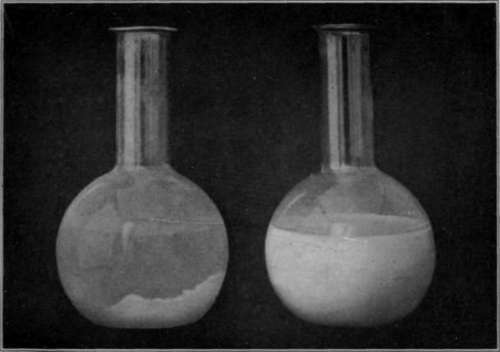 Two Flasks Containing Precipitated Silver Bromide: Left, Without Gelatine; Right, With Gelatine. The flask on the left shows that silver bromide without gelatine settles to the bottom of the solution. The one on the right shows the silver bromide held evenly in suspension by gelatine. The gelatine is soaked in water, and then when it is swollen it is dissolved by putting it in warm water and gently warming and shaking until it is all dissolved. Then there is added to this the right quantity of bromide. The bromide dissolves in the gelatine solution just as salt would, and is stirred up to get it evenly distributed. Meanwhile, some silver nitrate has been weighed out so that the right amount is taken to act with the amount of bromide chosen and is dissolved in water, in which it dissolves very easily. This silver nitrate solution is then added slowly to the bromide dissolved in the gelatine, and produces at once a precipitate of silver bromide. This silver bromide is sensitive to light so that before adding the silver nitrate to the bromide and gelatine all the white lights are turned out and the silver is added by the light of a photographic red lamp. As the silver is added a little at a time, the solution being stirred meanwhile, the gelatine becomes full of the smoothly, evenly precipitated silver bromide distributed through the solution. If the emulsion of silver bromide in gelatine is coated on the film and then cooled, the gelatine will set to a jelly, still containing the silver bromide suspended in it, and then when this layer is dried, we get the smooth yellowish coating, which is familiar to those of us who have looked at an undeveloped film in the light. If we look at the silver bromide film through a very high power microscope, we shall find that the silver bromide is distributed throughout it in the form of tiny crystals. These crystals are in the form of flat triangular or hexagonal plates, and careful investigation has shown that they belong to the regular system of crystals. When these crystals are exposed to light, no visible change takes place, but there must be some change because when a crystal of silver bromide, which has been exposed to light, is put into a developer, the developer takes the bromine away from the silver and leaves instead of the crystal what looks under a microscope like a tiny mass of coke, which is, really, the metallic silver itself freed from the presence of the bromine. It may seem strange that silver, which we always think of as a bright, shiny metal should look black, but when it is divided up in this irregular way, it looks black, although it is the same thing as the shiny metal we are familiar with, just as a black lump of coke is the same thing as the bright gleaming diamond. If the silver bromide has not been exposed to light, then the developer has no power to take away the bromine from the silver and leave the black silver behind, so that we see a developer is a chemical that has the power to take away the bromine from the silver in a grain of silver bromide which has been exposed to light but will not affect one which has not been exposed to light. Fig. 37. 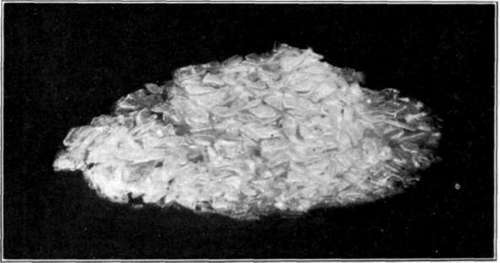 Crystals of Silver Bromide before (left) and after (right) Development. The photographs above, taken through a very powerful microscope, show crystals of silver bromide before development (on the left) and (on the right) some crystals after they have been changed into metallic silver by development. The crystals before development are transparent except where they are seen sideways or where their edges appear darker. After development the clear yellow silver bromide is turned into a black coke-like mass of silver in exactly the same position as the crystal from which it was formed. Wherever, then, the light in the Kodak acts upon the silver bromide crystals in the emulsion, the developer turns them into black grains of silver and we get an image, and where the light has not acted the developer has no action and no image is produced. The chemical part played by a developer, therefore, is the freeing of the metallic silver from the bromine associated with it. 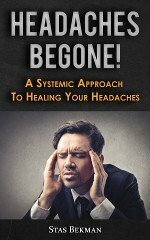 This liberation of metals from their compounds is the most important chemical process in the history of the human race. The great thing which has distinguished man from the other animals has been his ability to make and use tools and weapons, and man has progressed step by step from the earliest days when he used a flint fastened to a stick, to the present time, when he employs the marvelous machinery of modern civilization; but the greatest step in all that progress came when men found out how to get metals to use in the place of stone. All the earliest weapons were made of stone, and then men found a way of getting tin from its ores, and found that when this tin was combined with copper, which they found in the ground, they could get bronze, and for a long time all the weapons and tools were made of bronze, and then came the greatest discovery of all - they found that by taking iron ore and heating it with charcoal they could get the metal iron, which made such beautiful tools and weapons; and from the time that men found out how to get iron, they ceased to be savages and began to be civilized. Iron is got from the ore by heating it with charcoal or coke, which takes away the other components of the ore and leaves the metallic iron free. Metals can be got out of their compounds in different ways. Quicksilver, for instance, can be got by merely heating its oxide. If the red oxide of quicksilver be heated the quicksilver will boil off, and can be collected quite pure at once. Silver is rather easy to get, and, indeed, if we take a solution of silver nitrate and add some iron sulphate to it the metallic silver will be thrown out as a black sludge. The developers that we use in photography play the same part for the silver that the charcoal does for the iron; they take away the bromine from the silver bromide and leave the metallic silver behind. The emulsion coated on films and used for making the negative contains silver bromide with a small addition of silver iodide. The different degrees of sensitiveness are obtained by the amount and duration of heat to which the emulsions are subjected during manufacture, the most sensitive emulsions being heated to higher temperatures and for a longer time than the slower emulsions. If a slow bromide emulsion is coated upon paper, the material is known as bromide paper and is used for printing and especially for making enlargements. The less sensitive papers which are commonly used for contact printing by artificial light, contain silver chloride in the place of silver bromide. Materials which are to be used with development must not contain any excess of soluble silver, and the emulsion must be made so that there is always an excess of bromide or chloricle in the solution, since any excess of soluble silver will produce a heavy deposit or fog, over the whole of the surface as soon as the material is placed in the developer. In the case of Solio paper, however, which is not used for development but which is printed out, a chloride emulsion is made with an excess of silver nitrate, this having the property of darkening rapidly in the light, so that prints can be made upon Solio paper without development, a visible image being printed which can be toned and fixed. Solio paper can be developed with certain precautions, but only by the use of acid developers or after treatment with bromide to remove the excess of silver nitrate. In the early days of photography prints were usually made on printing-out papers, but at the present time most prints are made on developing-out chloride and bromide papers, which are chemically of the same nature as the negative making materials, and which are coated with emulsions containing no free silver nitrate.